2. I hate fish. No matter how hard I try, I can’t get myself to eat it. On the rare occasions I’ve tried it, I can’t help feeling grossed out the entire time its in my mouth, thinking about the ugly fish that I’m eating that smells bad and it’s just so disgusting be making contact with my tongue. I don’t mind shrimp. Go figure…they are uglier than fish. 3. Fingerprints give me an uneasy feeling-especially if I see a person’s fingerprints on their hands, say when they’re talking….and using their hands. I get a secret shiver up my spine if I catch a glimpse of them. They’re gross. I hate finger print smudges anywhere. 4. I have a slightly intense fantasy crush on Chris Noth, the guy who plays Mr. Big on SATC. Incidently, I tend to go weak in the knees at the sight of any tall (6’4″ perfect), dark haired, blue eyed, handsome man in a suit. I secretly, think one day he will come to his senses and sweep me off my feet….lol…My husband just rolls his eyes. 5. I have a deep desire to grow into a wise, hip, long white-haired old lady who finally has her crap together (despite her minor hypocondria!). 6. I’ve always had this inate feeling like in another life I lived on the East Coast. My soul seems to pull towards there. My distinct thoughts are, I might have been a whaler’s daughter. Just the thought of the sea , saltbox houses and harbor towns make my heart skip a beat. When I visit the east, I get such a feeling of belonging there, of familiarity. It’s almost scary. 7. I say I’m a city girl, but in all honesty, even though I live in Chicago, I don’t explore my city much at all. I actually prefer peace and quiet to the city (although, I do love NYC, and crave it on occasion), and I dream of one day having a quiet cottage on a lake with a porch, lots of books, an easel, paints, and grandchildren in the yard. 8. One more for good measure. I watched a show called the Science of Human Attraction, and in one part it talked about when you find someone you’re attracted to, you tend to love their smell. It’s something with the man’s sweat glands blending with a pheramone. I agree with this. My husband has a smell that I absolutely love. I can’t describe what it smells like, but it’s really nice, and it’s just for me. When he’s not in bed, I can smell it on his pillow. No matter what happens, that smell keeps me coming back for more and just might be the glue that keeps us together. He tells me he loves the way I smell, too-especially my hair. He says I smell like his Emmy. Aw….now, isn’t he sweet? And a keeper? 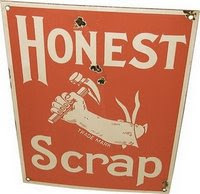 I must put a copy of The Honest Scrap Logo on my blog which I have proudly done! Previous post3 New doll designs for June! Congrats on the scrap. I also love guys with dark hair and blue eyes…altho not married to one, but dated one in high school eons ago and perhaps that is why I still remember him. Thanks! I like to eat fish but they gross me out when they're alive. The send shivers down my spine and get me practically make me sick. oh I hate fish too! But also love shrimp…lol. Yes, I get the smell thing. you either like a person's smell or you don't. Definitely. Congrats on your healthy tay-tah! Enjoyed reading your scrap list! Love this – I'm gonna get right on it!